This new book by dear friend and amazing gardener Allen Gilbert is a bitter sweet publication for me, as Allen died at the end of 2015 just as the book was sent to the printers. To read it now is to have Allen back here telling me all about his latest gardening passion. Never one to take anything on blind faith, Allen always tested every bit of accepted gardening lore. Grafting and Budding is full of the results of Allen’s experience, and it makes someone like me, who has never attempted either horticultural technique, feel that I might actually be able to bud and graft without messing it up. 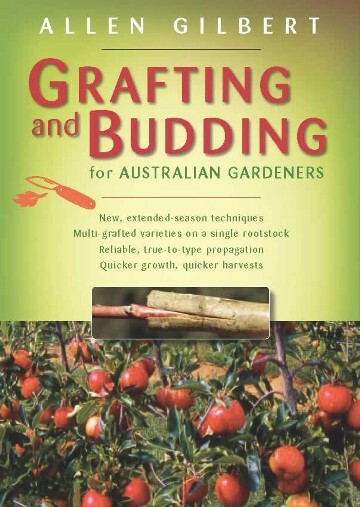 Chapters include Why Graft?, Basic Principles of Grafting, Of Scions and Rootstock, Tools and Hygiene, Grafting and Budding Methods, Special Purpose Grafts and Post-Graft Care. Among many other things, Allen explains that in Australia plants rarely become completely dormant, and that grafting in Australian conditions is relatively easy. Even beginner gardeners can do it (and I presume long term gardeners like me who have never been game to give it a go). Apparently, except for the coldest regions, most grafting can be done all year round. He also says that it’s important to know if one plant is related to another, and how closely, before you attempt grafting a scion from from one to another. In fact it’s a good idea to keep it within the family, botanically speaking. There is also good information on pruning multi-grafted trees to stop one becoming dominant. This book is full of this sort of wisdom with excellent diagrams and photographs to illustrate techniques and, as a first for me, also explains how to graft and bud Australian plants, as well as the more common fruits and vegetables. With our gardens becoming smaller, if we want to maintain the diversity of plants we grow, then grafting and budding becomes an essential skill. In Allen’s words, ‘Any gardener can graft’ and Allen and his book have encouraged me to give it a go. You should too.